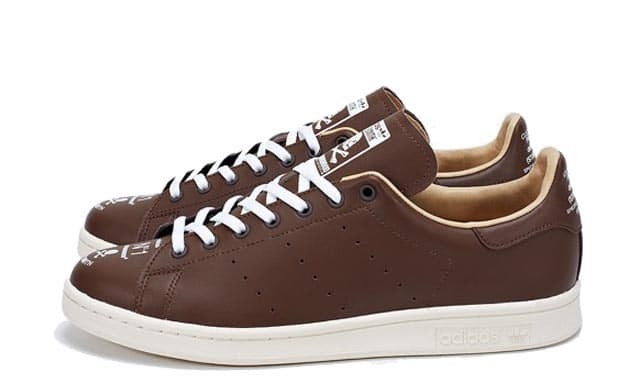 They’ve done Superstars, Gazelles, ZXs and a Campus(under their anglophile Luker subsidiary), so it makes sense that Neighborhood have given the Stan Smith their own look too. We were a little shocked to hear that the adidas Consortium Superstar35 project was almost a decade ago, but Shinsuke and the team have kept that relationship fresh through their evident enthusiasm for the brand. Sure, we’ve seen good Converse, PRO-Keds and Nike pieces with NBHD affiliations, but the 3-stripes makes a lot of sense. You can tell when a partner doesn’t mess with a brand until the lucre was waved, or a partnership created solely because some marketing doofus just discovered hype blogs and thought it was a quick fix for issues of credibility. We know that adidas’s relationship with Shin goes back a long time and, if we’re not mistaken, it was key to making the BAPE project happen. We thought that Neighborhood’s Stan would be made of black leather with some gothic imagery of some sort in the mix, but mastermind JAPAN were the ones that followed that formula for a wearable shoe. Instead, we get a brown leather with almost boot-like quality and a tan lining. As a palette, there’s no real panels to play with on this model — breaking from the tonal approach can ruin all that. There’s a risky move in the execution — the print on the forefoot. It’s the footwear equivalent of a face tattoo, albeit a well-executed one. We like that aspect of the shoe a lot, but we can imagine that it’s liable to put some folks off too, given the usual restraint that typifies this silhouette. We’re not sure what the inspiration for that placement was, but we’re assuming that it was something cool and hand built, because that’s generally the way with these folks. It’s amusing to see that the most simple shoe of the bunch has become one of the oddest adidas NBHD projects to date, but it’s nice to know that this is a company that’s still capable of delivering a shock. These will be in the store on Saturday.